Sweet and Spicy fresh Mango Salsa with kick of jalapeno, chilies, and sweet juicy strawberries. Perfect to scoop with chips. Full of color, and sweet-savory notes.. This bowl of salsa is meant to kick-start Super Bowl. What better way to greet cheering teams on Game Day but with bowl of Spicy Mango Salsa and Chips? Our favorite, Mango Salsa is one of the easiest salsa ever. 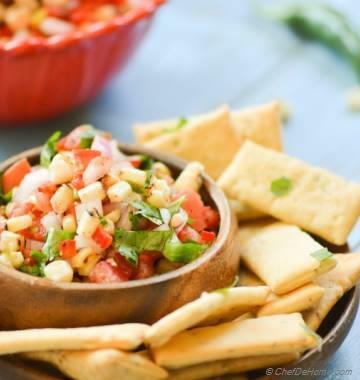 In mango salsa, sweet, fruity and spicy all come together to make delicious savory bite. Worth digging for. Just make sure to serve crunchy spicy chips on the side. When I saw mangoes in my grocery store last week.. I could not resist making a homemade batch and served with spicy corn chips for Sunday games. 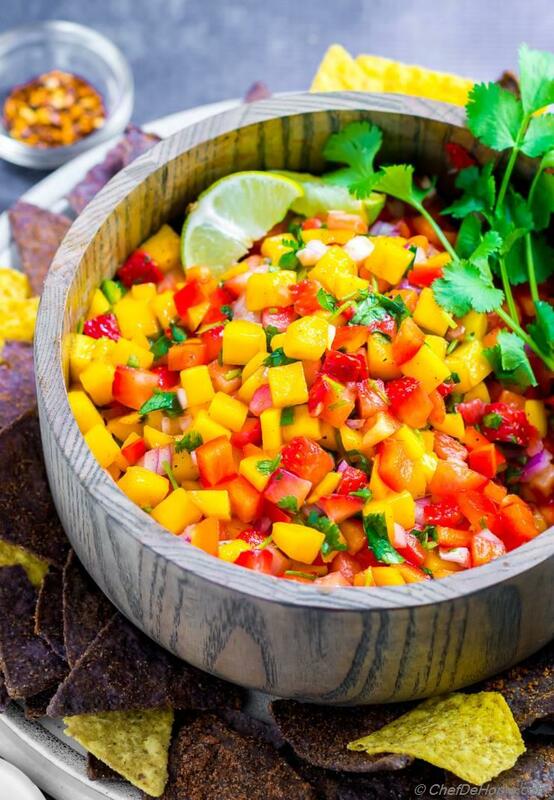 Mango Salsa is as easy to put together as dice all ingredients and mix in a bowl. Mango Salsa recipe has certainly got better over time. There are so many variation... But no matter if you buy mango salsa from Walmart or Costco, or make a batch at home (using my recipe of course). 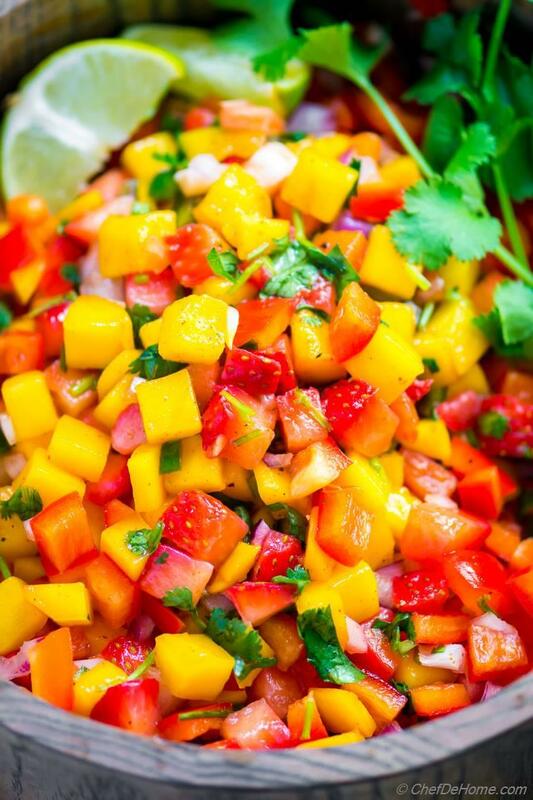 Three ingredients are must in every mango salsa. Mango, cilantro, and lime juice. I know! No kidding! Whenever I want to serve bowl of this Salsa at moment's notice.. I look no further than refrigerator. Combining these three with pinch of salt and chili powder. Leave aside for flavors to marry while warm a batch of tortilla chips. That's it. 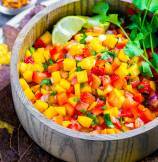 This variation of mango salsa recipe is special. It has sharpness of red onion, heat of jalapeno, sweet juicy strawberries and bell pepper for some color and crunchy texture. By adding strawberries, I made this a Mango-Strawberry salsa. But really, flavor mango surpass the strawberries. I still wouldn't make it without strawberries though because strawberries release juices when coated in lime and salt. 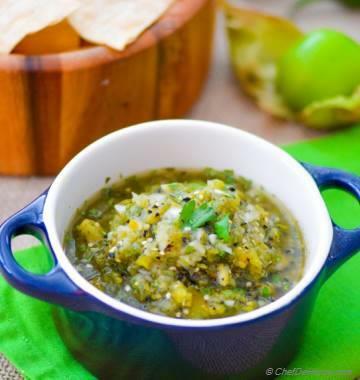 This givees more fresh and juicy consistency to mango salsa. (a salsa meant for chips). No doubt, my favorite here is the color. Love how these ingredients paint bright yellow mangoes in delicious colors of spring-summer. Believe me, I needed these colors in my life. 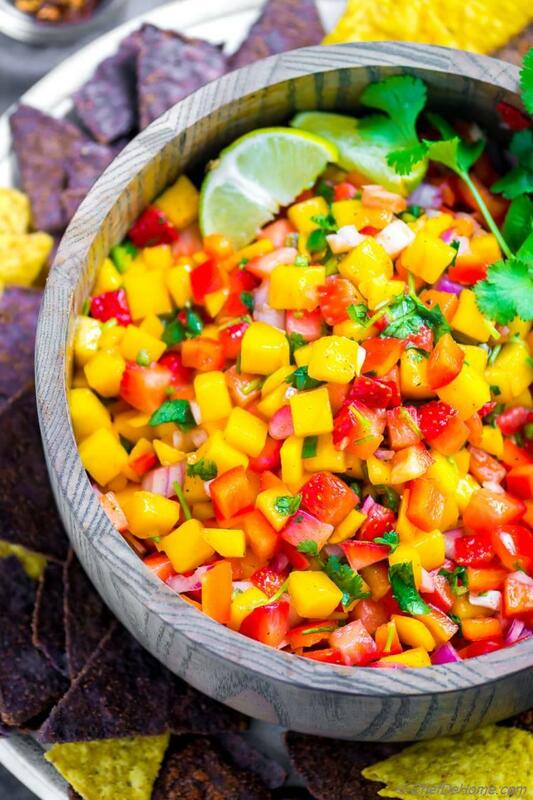 With all-time high rainy season and grey sky, this bowl of mango salsa was like my sunshine. LOVED it. Oh, and make some extra because it goes super fast. It's not yet mango season. Gosh, we miss mango season whole year when it's not. I still found fresh mangoes in my grocery stores last week. Most likely export quality but ripe, plum and sweet. You don't need overripe mushy mangoes for mango salsa. These should be ripe, bright orange yet still firm. TIP: If you are ever stuck with unripe mango. Don't let it go waste. Put it in a brown bag with banana. It ripen way faster. Don't keep in refrigerator. One thing though, this salsa is not really seasonal mango dependent. You can also make mango salsa with frozen mangoes or mangoes packed in water. (not in syrup that will be very sweet.) If you plan to use these, make sure to use all other ingredients fresh - berries, pepper, cilantro. These will balance the freshness just right. 2) weeknight roasted salmon dinner. 3) or zesty mango salsa salad with greens. 2) My Fav Slicer to dice perfect looking Mango, Strawberry and other veggies. 1. Peel and dice the mangoes, strawberries, red bell, and red onion. 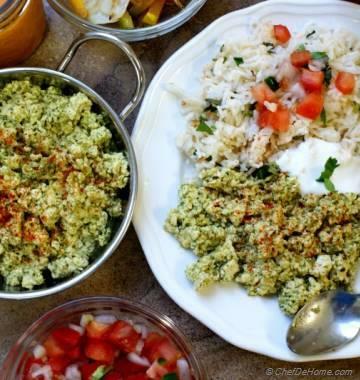 Chop cilantro and mince jalapeno. Add to a wide bowl, top with diced strawberries, bell pepper, cilantro, red onion, and jalapeno. 2. Top with lime juice, cayenne (if using) and salt to taste. (I end-up adding good 1/2 tsp). Toss to mix everything. ***Cover (refrigerate) until ready to use. Serve with chips. Enjoy! *Ripe, large mango, peeled and diced. About 3 cup when diced. **Adjust cayenne to taste. You can also use chili flakes or paprika (not smoked) if you prefer. ***Covering and leaving aside salsa after mixing makes Mango Salsa even better. During this time, both mango and strawberries release their juices, adding delicious sweet and tangy flavor to the salsa.